https://matcha-jp.com/en/6271 Savor High Grade Wagyu Beef And Yakiniku At Jiromaru Shibuya! Savor High Grade Wagyu Beef And Yakiniku At Jiromaru Shibuya! 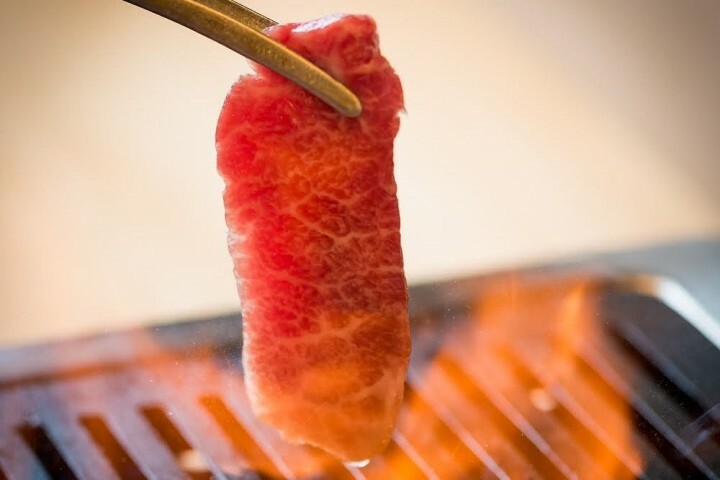 At Jiromaru Shibuya, a Japanese yakiniku restaurant for single diners in Tokyo, customers can enjoy a variety of high grade wagyu beef, served one piece at a time. Here you can taste wagyu beef and other classic Japanese barbecue dishes. Shibuya is an area crowded with over 30 popular yakiniku (Japanese barbecue) restaurants. The area has a variety of high-end restaurants, cheap restaurants, restaurants known for their barbecued inner pork organ meat, and Korean-style yakiniku restaurants. There is such a wide selection that that you’ll be conflicted on which restaurant to choose. Most yakiniku restaurants are designed so that multiple people sit surrounding a table grill. There are course-style options with five to six pieces of meat per plate, even if you order individual items. A large party is perfect for going to a yakiniku restaurant. If you’re by yourself, however, you might become full just by eating two or three types of meat. If you’re wanting to try different types of meat yourself, we recommend a restaurant complete with a yakiniku service for single diners. You can taste high grade wagyu beef starting from a slice at Jiromaru Shibuya (Jiromaru). Standing-only izakayas (Japanese pubs) allow customers to freely eat and drink, and are popular in Japan despite there being no seating. Jiromaru, like standing-only izakayas, has no seating, and is an unique yakiniku restaurant where you can enjoy standing and eating yakiniku. To get to Jiromaru, walk three minutes from the Hachiko ticket gates at JR Shibuya Station, then continue along the side road of the commercial complex Shibuya Mark City. The exterior of the shop front has the appearance of a sushi restaurant. There are seven yakiniku table grills installed onto the counter inside. The capacity of the shop itself is fourteen people, but up to three people are able to use a single grill. Jiromaru’s strength lies in the fact that you can enjoy A4 and A5-grade high quality wagyu beef (*1) reasonably from a single slice. Furthermore, the service is quick, so you can enter the restaurant without waiting long even during busy hours. Leave your belongings on the hanger or luggage basket under the counter so that you can eat comfortably. *1 Beef grades: an index indicating the quality and yield rate of the beef. The grades for yield rate consists of three levels from A – C (with A being the highest grade) while meat quality consists of five levels from 1 – 5 (with 5 being the highest). There are two ways to order yakiniku. Please order with the method that works for you. There are two additional language menus available in English and Chinese. We recommend a set that comes with six different types of meat and twelve pieces in total (240 grams) called the Wagyu Beef Set (3,000 yen before tax). You can enjoy the great balance between differently textured meat, such as the recommended wagyu beef that just received that day, and fatty meat. The set only comes with meat and does not include rice (280 yen before tax). If the Kobe beef has arrived that day, then you can add it to your order for 300 yen (before tax) per piece. Please ask an employee for details. If you think that the Wagyu Beef Set is a bit large in quantity, there is also the Wagyu Beef Half Set (1,500 yen before tax). The types of meat available in the Wagyu Beef Set also changes depending on the ingredients that arrived that day. The staff at Jiromaru are meat specialists. They assist customers choose their favorite meat by explaining each section of the meat while listening to the customer’s requests. Differences in language support will arise depending on the staff, but they will diligently provide you with suggestions while showing you each product. You can also order by pointing to a meat that you’re interested in from the counter showcase and saying, “This, please.” The staff will explain to you the price of the meat per piece and what part of meat it is. Once you’ve ordered, all that is left to do is to grill your meat to your preferred doneness on the provided grill at your seat. It’s easy to burn your meat if you place it on the edge of the grill, so be sure to cook your meat at the center of the grill. We asked Mr. Ogiwara, the manager of the Shibuya branch, the trick to enjoy the delicious yakiniku at Jiromaru. Manager Ogiwara: “All of the meat at this branch is blanched in salt water made with a uniform consistency and is then seasoned. I recommend eating the meat as is without dipping it into any sauce. Now then, next, we’ll introduce types of meat we hope you try when you visit Jiromaru. Sankaku Bara (a section of shoulder chuck rib) (300 yen before tax per piece) is an A4-grade Tochigi wagyu beef with a soft, rich flavor that will spread throughout your mouth. It is a fatty cut with volume, so we recommend this as your first piece of meat. Togarashi (a rare section of meat near the shoulder blade called chuck tender) (290 yen before tax per slice) is an A4-grade Tochigi wagyu branded beef and is recommended if you prefer lean meats. The great flavor of the meat will spread juicily in your mouth. Bara Ita (beef ribs) (180 yen before tax per slice) is a thickly cut A4-grade domestic wagyu beef with a perfect chewy texture. Our writer enjoyed this cut very much. You can enjoy the flavor in the salt-based meat without dipping any of it in sauce. The cut of the meat will also vary depending on the section of meat, so you can also enjoy a change in chewy texture. Payment here is done at your table. If you’re ordering a piece at a time, then you might get worried about the cumulative total of your order. If that’s the case, ask the staff and you can be issued a receipt before you pay. The staff at Jiromaru, who give thorough suggestions based on your preferences, are like meat concierges. Your meat will taste even more delicious if you seek advice on the grilled doneness of each section. When you want to try various sections of meat, or when you want to stand while eating, or even when you want to spontaneously eat yakiniku by yourself, take a trip to Jiromaru. At this cozy shop you can enjoy affordable and high grade wagyu beef the way you want. Misono - A Yakiniku Shop In Ikebukuro Perfect For Solo Diners! 10 Shibuya Lunch Spots - From Local Cuisine To Muslim-Friendly Shops!